Today I am embarking on my second raw food for 30 days challenge. The main thing I notice is that it is also making me feel raw emotionally! It’s only 7.45am in the morning and I’ve already noticed that I’ve been triggered to feel anger, sadness, exclusion & jealousy….a juicy combination and I haven’t even got the juicer out…..
Last time I went raw for 30 days was in March 2013 and it was one of the coldest Marches I remember with snow and frost for a few days and I found it really hard. Even though I knew the importance of drinking fresh fruit and vegetable juice, I did not have enough and I felt depleted so, this time around I will be making juice every day or buying freshly made juice, for example from the new juice bar in Ilfracombe, if I am out and about. Why am I taking this challenge? I’ve studied many naturopathic books: Bernard Jensen’s Tissue Cleansing through Bowel Management, Richard Anderson’s Cleanse and Purify Thyself Books 1 and 2 and Raw Family by Victoria Butenko. What they say makes total sense to me and any time I’ve fasted, eaten raw and practiced Rich Anderson’s Master Phase Cleanse protocol, which we run here on a regular basis I feel better, more in touch with myself, with others and more in touch with the Universe and my spirituality. So, for me this is the way to go. Getting up to pee at night, tightness in my back at the top around the shoulders, some stiffness and tightness around the ileo-sacral hip joint. I practice yoga postures daily in the morning but these areas of stiffness come back. I’d also like to take the stress of digesting cooked food off my body, feel more emotionally balanced and eat in a way which is more sustainable for the planet. having said that I do love tropical fruit and coconut and I know that these are flown half way round the world to the UK. I don’ think that I can give these up quite yet. But at least I will not be consuming animal products. Another goal is to have more energy to work with clients. I know from reading about Fred Bisci and Matt Monarch and others that they seem to have very high energy and that is what I’d like to enjoy too. I’m aware that cleansing and eating raw can also bring up a lot of emotional ‘stuff’ that has been hidden in the body and so I will be writing about the mental/emotional journey that I am going on as well. As I work with many people who are going through emotional challenges I would like to find more ways to help them through this process as well. Eating raw, I think, will bring me more self awareness to help others. 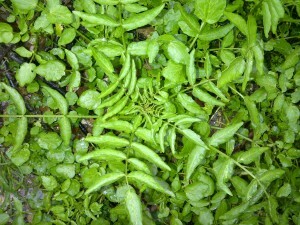 My Shiatsu practitioner says to me: you are already firey try reducing bitter leafy greens but I know intuitively that this is the food I like. They also recommended me to eat pressure cooked grains and beans for a grounding, strengthening energy but I know that any food that has been heated beyond 112 degrees has no enzymes left in it so, I don’t want to be eating this food. The hardest thing for me is going to be to eat no cooked carbs, as I love baked potatoes, Singapore noodles, a slice of rye bread with coconut oil and some jam but, I also know that all these foods are comfort foods for me and I reach for them when I want to be emotionally comforted. So, during this challenge I am aware that I will be finding comfort for myself in other ways. when I feel like comfort eating I can do some mindful meditation, notice my emotions and discover what is going on in my body. I love green smoothies and I find them very comforting to drink, I love raw chunks of coconut, I find it very satisfying and I will make myself some delicious satisfying tea time foods, which I’ll be sharing, instead of toast! I have been vegetarian for many years and eaten a plant based diet since January. I have not been a consumer of tea, coffee, alcohol and sugar for many years so, I am starting with a pretty clean body. I don’t eat wheat on a regular basis but I have enjoyed the occasional veggie pasty from our village bakery in Combe Martin or a sandwich, if I have nothing else on the motorway but, I’ve always noticed that if I eat bread it makes me put on weight, like a little belly and then I crave it. For me I find it very addictive. The bread that I have mainly eaten for the last few years is Sourdough rye bread. this has been the best for my digestive system, which was very weak, for many years, from having been overdosed with antibiotics as a child and other factors! So, this is my challenge and I’m intending it to be enjoyable and I will like sharing the journey as well as I hope it will help other people who’d like to take this path. 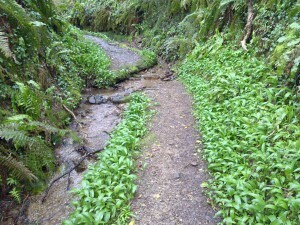 wild watercress and garlic path – Combe Martin, Devon.